Leaders in Lebanon’s Palestinian refugee camps say they are trying to keep the areas from becoming flash points for violence ignited by the crisis in neighboring Syria but warn that the task is becoming increasingly difficult with hard-line Islamist groups on the ascendancy. Palestinian President Mahmoud Abbas on Friday wrapped up a three-day visit to Lebanon, where he has been reassuring officials that the country’s 12 Palestinian refugee camps will not be drawn into the fallout from Syria’s war. But in the cramped, ramshackle streets of Ain Helweh, Lebanon’s largest Palestinian camp and home to a plethora of armed political factions, brewing sectarianism is difficult to suppress, camp officials said. The history of the Palestinian camps in Lebanon, set up for those fleeing the 1948 Arab-Israeli war, is a tumultuous one, and concerns that the camps could again become the site of violence have increased as sectarian tensions in the country have risen. Those worries were compounded last month as Palestinian gunmen from the outskirts of the camp, located in the southern city of Sidon, joined militants loyal to the city’s radical Sunni cleric, Ahmed al-Assir, in a battle against the army, which turned the coastal city into a war zone and left 18 soldiers dead. Palestinians in Lebanon largely sympathize with their fellow Sunnis in the Syrian opposition and have set fire to aid boxes sent by the Lebanese Shiite movement Hezbollah to protest its decision to send fighters to back Syrian President Bashar al-Assad. An influx of refugees from Syria and growing sentiment against the Lebanese army amid reports it was fighting alongside Hezbollah in Sidon make the situation difficult to contain, analysts said. The sectarian politics on the rise in Syria and Lebanon “reinforces the militant radicals,” said Paul Salem, director of the Carnegie Middle East Center in Beirut. “The mainstream leadership can try and keep the lid on it, but puffs of steam will erupt now and then,” he said. Those mainstream leaders, from the Lebanese branches of Palestinian political parties Fatah and Hamas, say they fear that the growing popularity of — and anger among — members of the camp’s more hard-line Islamist factions could jeopardize the position of Palestinian refugees in the country. 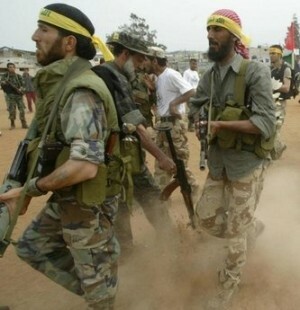 In particular, they worry that Ain Helweh could be drawn into a scenario like that which unfolded in the northern Palestinian camp of Nahr al-Bared in 2007, when militants from the radical Sunni group Fatah al-Islam took over the camp and fought a 31 / 2-month war with the Lebanese army. Maqdah said the situation in Ain Helweh was “unified,” with the camp’s 17 factions working together to prevent conflagration. But last week, a member of one Islamist group fatally shot a Fatah bodyguard in the camp, according to the state news agency. The atmosphere in Ain Helweh, home to about 70,000 people and generally considered the most dangerous and heavily armed Palestinian camp in Lebanon, remains tense. What appears to be an ordinary battered garage door on a dusty side street opens to reveal the driveway to Maqdah’s villa, where 16 closed-circuit television feeds help him monitor the camp’s streets. “There are a few troublemakers,” he said. The troublemakers include those who identify themselves with Jund al-Sham, a Palestinian-Lebanese Islamist faction linked to al-Qaeda, he said. A fighting force of no more than 70, they are located in the Taamir neighborhood on the outskirts Ain Helweh. Abu Ahmad Fadel Taha, the political representative for Hamas in the camp, intervened personally and negotiated between the Jund al-Sham gunmen and the army during the Sidon clashes. “The situation was very dangerous, and we were very scared after the incidents of Nahr al-Bared that this camp would have the same destiny,” he said. Though fighters were diffused when news spread that Assir had escaped from his Sidon mosque, which had been besieged by the army, Taha says he fears for the future. Reports in largely pro-Hezbollah media have said that Jabhat al-Nusra, the Syrian jihadist group that the United States considers a terrorist organization, has set up a base in Ain Helweh. Taha said Jabhat al-Nusra does have representatives in the camp, but they are involved in recruiting fighters for Syria rather than plotting activities on Lebanese soil. More dangerous for Lebanon, he said, is that “sympathies and support” have increased in the camp for hard-line Islamist forces, including Osbat al-Ansar, which is also on the U.S. terror list, and the closely linked Harakat Islamiya al-Mujahidda. For the moment, he said, they are not interested in drawing the camp into violence. “As long as the Islamic forces are convinced that they should keep the camp neutral, there will not be trouble, but we are worried,” he said. Analysts said the danger lies in those factions becoming more hostile to the armed forces in the wake of the Sidon clashes. In the first confirmation that he was alive, Assir released an audio recording online Thursday describing a conspiracy between the army and Hezbollah against Sunnis. Residents of Ain Helweh speak of harassment since the clashes. I’m sure the Christian Palestinians are very edgy … always. That the camps are filled with weapons is an atrocity, of course. I’m sure the Christian Palestinians are very edgy ….